Thanks to the technological advancements in blood collection and processing procedure, rising usage of blood plasma products in the human food as well as pet food products industries, and improved supply chain and distribution network across the world, the global market is expanding phenomenally. The rising demand for these plasma products and derivatives has changed the dynamics of this market, which accounted for US$1.04 bn in 2015. Analysts estimate the opportunity in this market to increase at a CAGR of 7.10% between 2016 and 2024 and reach a value of US$1.92 bn by the end of 2024. Cell culture media, the food industry, the pharmaceutical industry, sports nutrition, nutrition supplements, the cosmetic industry, the diagnostic industry, and the pet food industry are the key application areas for animal blood plasma products and derivatives. Among these, the demand for these plasma products is higher from cell culture media and the food industry compared to other application segments. The scenario is likely to remain so over the next few years. The food industry, especially, is anticipated to report a significant rise in the demand for these plasma products and derivatives in the near future due to increased demand for nutrient added food products in developed economies. Cell culture media, on the other hand, is expected to be driven by its growing importance in the field of conventional research and in development and production of vital biomolecules and therapeutics. Geographically, the Middle East and Africa, North America, Asia Pacific, Europe, and Latin America have been considered as the main segment of the worldwide market. Of these, North America acquired the topmost position in 2015 with a share of more than 30%. The growth of this regional market heavily driven by the presence of well-established market players, who continue to innovate cell culture applications and constantly focus on the diversity of various cell lines and their cellular interactions to develop different cell cultures. Over the coming years, North America is anticipated to retain its leadership, thanks to the increasing usage of animal blood plasma products and derivatives in various applications, such as sports nutrition and the pet food industry. Apart from this, the early availability of advanced technologies for blood fractionation and the increased import of Australia and New Zealand live cattle animals, which is further utilized for the production of plasma products and derivatives, is also expected to support the North America market for animal blood plasma products and derivatives in the years to come. Asia Pacific, which closely followed North America in 2015, is projected to continue to exhibit a high growth rate over the next few years, thanks to the growing demand for animal blood plasma products and derivatives in Australia, New Zealand, and China. The availability of untapped opportunities and the presence of vendors throughout the region is also predicted to aid the market in Asia Pacific in the near future. This report on animal blood plasma products and derivatives market studies the current as well as future prospects of the market globally. The stakeholders of this report include companies and intermediaries engaged in the manufacture, commercialization, providing products and derivatives of animal blood plasma such as Immunoglobulin, Fibrinogen, Serum Albumin, Fetal Bovine Serum, and Others (thrombin, new born calf serum, etc.) as well as new entrants planning to enter this market. This report comprises an elaborate executive summary along with a market snapshot providing overall information of various segments and sub-segments considered in the scope of the study. This section also provides the overall information and data analysis of the global market with respect to the leading market segments based on major derivatives type segment, application, animal type and geographies. Based on derivatives type, the animal blood plasma products and derivatives market has been segmented into: immunoglobulin, fibrinogen, serum albumin, fetal bovine serum, others (thrombin, new born calf serum, etc.). Each of the market segments have been extensively analyzed based on the market related factors such as widening scope of animal by-products in different application, and improving supply chain and distribution network in the various geographies. Moreover, historical year-on-year growth have been taken into consideration while estimating the market size. The market size and forecast in terms of US$ million for each segment has been provided for the period from 2014 to 2024. The report also provides the compound annual growth rate (CAGR %) for each market segment for the forecast period from 2016 to 2024, considering 2015 as the base year. The market overview section of the report explores the market dynamics such as drivers, restraints, and opportunities that currently have a strong impact on animal blood plasma products and derivatives market and could influence the market in the near future. Market attractiveness analysis has been provided in the market overview section in order to explain the intensity of competition in the market across different geographies. The competitive scenario among different market players is evaluated through market share analysis in the competitive landscape section of the report. All these factors would help market players to take strategic decisions in order to strengthen their positions and expand their shares in the global market. Geographically, animal blood plasma products and derivatives market has been into five major regions: North America, Europe, Asia Pacific, and Middle East & Africa. The market size and forecast for each of these regions has been provided for the period from 2014 to 2024, along with their respective CAGRs for the forecast period from 2016 to 2024, considering 2015 as the base year. The report also provides with market size and forecast for major countries in the respective regions. A detailed qualitative analysis of factors responsible for driving and restraining the market growth and future opportunities has been provided in the market overview section. This section of the report also provides with market attractiveness analysis, Porter’s five forces analysis, value chain analysis, pricing analysis and market share analysis by key players, thus presenting a thorough analysis of the overall competitive scenario in the global market. The key findings section included in the report would assist existing market players in expanding their market shares, and new companies in establishing their presence in the global market. 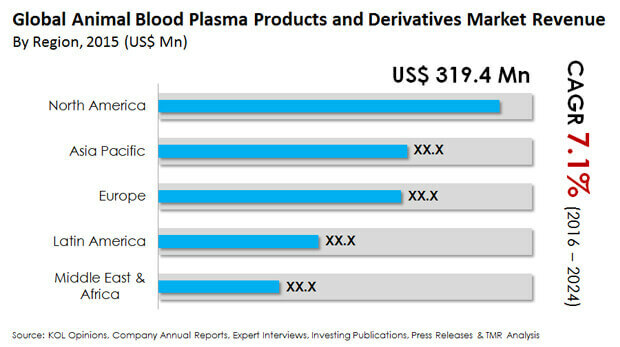 The report also profiles key players operating in the animal blood plasma products and derivatives market which are Proliant Inc., Bovogen Biologicals Pty Ltd., LAMPIRE Biological Laboratories, Inc., Rocky Mountain Biologicals Inc., Thermo Fisher Scientific, Inc., Sigma-Aldrich Co. (Merck KGaA), Kraeber & Co GmbH, Auckland BioSciences Ltd., Lake Immunogenics Inc., etc. The global market is dominated by three global vendors that accounts for more than 76.4% share of the global market.